I made a Mediterranean heirloom salad for Easter. I turned said salad into a cold “meal” salad by adding a pound of cooked spiral pasta. I’ve been picking at this salad almost every day for lunch. I brought it with me to work today and noticed that the salad had become bland despite the balsamic vinegar, garlic and basil that I used. I decided to add a little salt. Today’s lunch was ruined. I was left with a tupperware bowl full of al dente snot. I’ve been commuting to Marble Falls from south Austin every workday since early June of last year. It’s approximately 50 miles one way. It’s a nice drive because I don’t contend with much traffic and I travel through the Texas hill country. Sometimes I dread the drive, but most often it’s a chance for me to wake up, unwind, practice my air guitar, talk on the phone, do crossword puzzles, take a nap, trim my toenails and work on my fictional memoire that focuses on the socioeconomical uprising of Uganda and the impact it has on foreign exchange in northern Europe and the cost of Yu-Gi-Oh trading cards in rural (population being 3,125 voters or less) convenience stores in the contigious United States. I’ve seen a lot of changes along Hwy 71. I’ve felt a lot as well. I’ve been through a Summer, Fall, Winter and now Spring. I’ve driven home with the A/C cranked under the bright Texas sun in a black truck with gray vinyl seats. I’ve left work at five o’clock as the sun was going down during the winter and shivered for the first 15 minutes of my commute home as the engine became warm and gradually lended its heat to the blowing heater. I’ve seen deer dart across the highway. I’ve seen more deer carcasses (among other animals) than I’ve seen growing up in the country and in all of my days hunting. I’ve hit a deer on the way home. I’ve seen the aftermath of three head-on collisions. I’ve seen a jackknifed 18-wheeler that had constricted a Ford pickup truck in a freak accident. I’ve driven past much death. Everyday I drive by two roadside flower memorials for two motorcycle cops that died recently on the road. My wife doesn’t like my commute. I do. It gives me the opportunity to think. And to pass wind before I get to the office. That’s hard to do during the ferocious Texas Winter month because you don’t feel much like rolling down the window. I pass real estate billboards. “Landrush!!! Hurry and buy now before they’re all gone!” I don’t think a lot has been sold in the ten months that I’ve been driving by. I’ve been watching the construction of the new Galleria that’s being built on 71 in Bee Caves. I’ve been stalled at 71 and 620 because of Willy Nelson, Los Lonely Boys and Norah Jones concerts at The Backyard. Although a normally listless commute, there is activity. I’ve seen business grow and fail. One by the name of Buddy’s Burgers stands out in my mind. I watched Buddy’s Burgers grow from the ground up. One day I drove by and there were bulldozers plowing down trees. Then the backhoes digging. Then the bulldozers cleared a gravel driveway. Then the foundation. Then the brick. Plumbing, electricity, gas, etc. etc. To sound like I know what I’m talking about, I’m going to say that there are three R’s that apply to “location location location”: Real estate, Retail and Restaurants. I’m sure you could also include hairy moles and your place in line for William Hung concert tickets when it comes to location, but that’s not what I’m getting at. Buddy decided to build Buddy’s Burgers in the middle of nowhere. The spot he chose is just a little north of the hopping town of Spicewood (population 348 and no Yu-Gi-Oh trading cards). He built a limestone shack from which to sell, what I would assume, would be Buddy Burgers. I never stopped by for a Buddy Burger because 1) the speed limit is 70 mph in front of his shop and 2) I think this was a cash and carry establishment. I don’t crave a Buddy Burger at 8 a.m. or 6 p.m., I don’t carry cash and I’m leary about buying a food from a shack the size of an apartment bathroom in the middle of nowhere that has one truck (I’m sure it was Buddy’s) in the parking lot. Around Christmas time ol’ Buddy had a big, hand painted ‘NOW OPEN’ sign painted on a large piece of particle board that was propped against a saw horse and had lined it with white Christmas lights. I didn’t stop for a Buddy Burger. I don’t think anyone else did either. Now that Spring has sprung, the Bluebonnets and Indian Paintbrushes have canvased the roadsides and the grass and trees are lush with greens and pinks, there are no patrons of Buddy’s Burgers. Buddy’s truck is no longer in the gravel parking lot. The ‘NOW OPEN’ sign has been long since been blown over. Now there is a shell of ill-conceived little business meant to serve greasy-spooned comfort. Cash tomorrow = location location location. And Yu-Gi-Oh cards, of course. My iPod is synced with iTunes on the iBook. I drive back and forth to Marble Falls everyday. That’s a good two hours of music listenen’ every day. I try to rate every song as I hear it on the iPod. I have a smart playlist in iTunes named “Top Shuffle” that contains songs with a rating of three stars or higher. I sync the iPod shuffle to the “Top Shuffle” playlist. That way only what I consider good songs are on the shuffle, therefore I don’t have to fast forward very often. Rating music in iTunes is a great way to gid rid of music that’s hogging space on the iBook’s hard drive. Next I’ll create a smart playlist in iTunes that contains songs with one star. Review and delete. Have I mentioned my distaste for Dell lately? I will not buy from Dell only because of the people that Dell puts behind the phones. I know quite a few people that sell for Dell. They’re all great people. They also speak English. In Dell’s favor I must admit, from my experience, they sell great computer hardware and have a rabid accounts receivable department that I would love to have in my own office. If my company is fifteen seconds late on paying a bill, Dell’s Bangalore call center is ringing my phone off the hook. Today I was told that the company owed “One hooondud eety debben doolah and deen zints”. Yes, if you read that aloud, you heard correctly. Try it again. Repeat it a few times. I’ll wait. Still can’t get it? Don’t feel bad, I couldn’t either. After a tense exchange, I was able to determine that I owed one hundred eighty seven dollars and some change. Ahhhh… yes, sounds exactly like seventeen. The rest of the call was equally painstaking. So I paid off our outstanding balance. I think. That or I ordered the tandori chicken. Piggy recently left AMEN and joined Wednesday 13, a band that I personally like a lot more and I wish him all the best. Watch Wednesday 13’s video “I Walked With A Zombie”. TiVo, DVR or a new VCR? 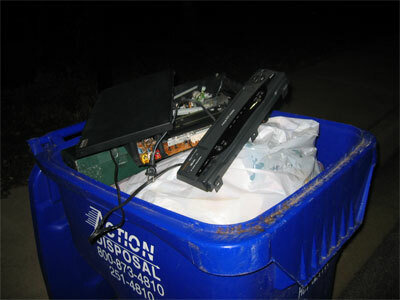 Our VCR crapped out on us tonight. I wanted to watch “American Chopper”. Elise wanted to watch the season premiere of “The Bachelor”. Elise recorded “The Bachelor” while we watched “American Chopper”. After my show was over, we were going to watch her show. She went to rewind the video and both of our eyes widened when we heard a shriek and the sound of gears grinding. It was the VCR. We both tried ejecting the tape. No luck. I grabbed a beer, the VCR and a screwdriver. 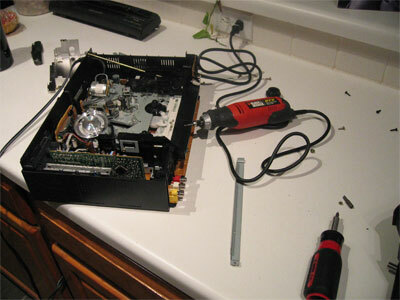 I couldn’t fix the VCR. Next step: Salvage the tape. I took out every screw that I thought was holding the tape in the VCR. No luck. Out came the dremmel. I cut the tape out. Now the tape is out and we’re watch a most riveting first episode of “The Bachelor”. Now I have to figure out if we’re going to get 1) a new VCR on Ebay 2) pay monthly for TiVo or 3) buy a DVR that will record one channel while we’re watching another and is not subscription-based. I’m opting for the latter, if it exists. You can also flood Janicek.com using Netdisaster. Elise and I had, what I would assume, an underpaid door-to-door representative from the Texas Campaign for the Environment stop by and ring the doorbell while I was cooking dinner. Elise answered the door and I was quickly behind her (I knew it was going to be an annoying salesperson at the door). Today’s campaign call: How waste policies, super-sized dumps and E-waste are trashing the Lone Star State. Specifically, how Apple Computers, Inc. has no free hardware recycling program leaving lead and mercury to seap into the ground and into our drinking water. Anyway – had I answered the door, I would have politely said “No, thanks.” and shut the door. Since Elise answered the door, we had to hear the whole pitch. Part of said pitch included, and I quote: “Yeah, and, um, Jacob Kobbs (as he pointed to Steve Jobs’ name on the petition) won’t shell out just a little bit of cash for a recycling program”. Blah blah blah… “Yeah, and, uh, Texas is number 46 in education.” Really? Had someone who knew what they were selling stopped by, I might have donated to the cause. Instead I sent him on his way and he left us with some literature. Josh Janicek: How was Easter? Three blondes died and found themselves standing before St. Peter. He told them that before they could enter the kingdom, they had to tell him what Easter was. St. Peter said “Noooooo,” and he banished her to hell. 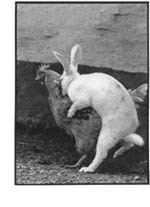 She said, “Easter is a Christian holiday that coincides with the Jewish festival of Passover. Jesus was having a Passover feast with his disciples when he was betrayed by Judas and the Romans arrested him. The Romans hung him on the cross and eventually he died. Then they buried him in a tomb behind a very large boulder. And, as always, I present you with Bill Hicks on Easter. I’m in the process of making Easter dinner. Elise and I will be alone so I figured what would be better for just the both us than a frozen 1o.5 lb. turkey that’s been around since Thanksgiving? The turkey’s been thawing in the fridge for the past few days. I’ll take it out tomorrow morning so it will get close to room temperature by the time it’s ready to cook. Rob Olvera gave me that pointer. Supposedly your turkey won’t dry out as easily because the inside of the bird doesn’t take as long to cook. I’ve never roasted a turkey (that I can remember) so this experience should be interesting. I’m going to rub the bird in a garlic cilantro butter and stuff it with citrus and sage. On the side I’ve already made a Mediterranean heirloom salad – heirloom tomotoes (which I sampled and realized that I still can’t stand the taste of tomatoes in large quantities), purple onion, garlic, yellow bell pepper, fresh mozzerella, steamed asparagus, steamed artichoke, fresh basil and mint, extra virgin olive oil and balsamic vinegar. Tomorrow I’ll make either ancho bock smashers or grilled potatoes with an ancho and chipotle bock dressing. I’ll figure that one out depending on 1) weather 2) mood 3) time willing to spend in kitchen. I went to Central Market today. I could live there if it wasn’t for all of the people. I left the house just as it started to rain. My thinking was: I’ll go to CM and pick up a few things for the salad, a few herbs and a couple other odds & ends. I’ll spend $30. $70 later I’m walking out of the store with two large paper bags. I prefer paper bags when I shop at Central Market because 1) they’re larger 2) it’s the trendy thing to do and 3) since I am a tree hugging, bra burning, patchouli stinking hippy I like to think that my grocery shopping refuse will rapidly biodegrade along with my aluminum cans, batteries and plastic bags that I get when I shop at other grocery stores. I walk to the truck in the pouring rain. I’m one of those guys who won’t drive around the parking lot in search of a good spot. I’ll park in the furthest spot from the store. I always find myself out of my truck and in the store before parking spot shoppers have found “the spot”. Lazy. So I walk to the truck. I’m drenched as are my bags. I drive home, park the truck, get out, get my bags, head for the door… almost there… Crash, Boom, Splash. The bag in my right hand ripped open and the only thing that decided to make a run for it was my 48 oz. bottle of nice extra virgin olive oil. It shattered and olive oil spilled out all over the garage floor. I had to clean it up. That sucked. Big time. Damn trendy hippy bags. This is a great write-up on being a bicycle courier. Recently I’ve really been missing riding my bicycle. I used to ride to and from work. And yes, I took it off some sweet jumps. I’m going to save my babysitting and lawn mowing money and buy myself a new bike. I know what I’m going to do with Riley.